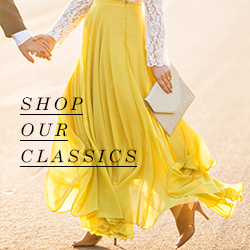 Our best selling Amelia Full Yellow Maxi Skirt is a closet staple we love styling different ways! This gorgeous yellow skirt is especially fitting for this season, and styling your Amelia Maxi Skirt for the Fall can help you expand your wardrobe! For those of you who love bold maxi skirts, or even if you’re new to the maxi skirt game and are trying to incorporate maxi skirts into your everyday wardrobes now that Fall is here, we’ll show you that they’re easier to style than you think. The key to styling your Amelia skirt for Fall is to tuck in a blouse or camisole, and adding on your favorite layers whether they be jackets, button-up shirts, or oversized scarves! Check out our outfit ideas below and let us know which one’s your favorite! Don’t forget to follow us on Instagram and tag us at #shopmorninglavender for a chance to have your favorite Amelia skirt outfit featured on our page! Weekend Getaway – Labor Day is Around the Corner! 3 day weekends are the perfect excuse for a mini getaway, and whether you’re traveling far or opting for a stay-cation we’ve got the labor day weekend wardrobe for you! These carefully selected pieces are lightweight and feminine staples that will ensure a stress-free few days of cute ensembles! Our short guide to light packing will give you outfit choices for the entire weekend so that you can avoid staying up all night packing, and just focus on your long-awaited break from work! We picked everything from our favorite printed scarves and kimonos to the jewelry options that will go with every outfit! Don’t forget comfortable and cute flats that will be the one pair that lasts you all weekend long! Our best tip is to keep your accessories at a minimum because too many options will clutter your carry-all weekender bag, and you’ll end up with a tangled mess! See our outfit options below featuring tons of fun and feminine Summery pieces! If you love this Labor Day weekend wardrobe, don’t forget to check out our Style & Comfort Traveling Tips! We make it a top priority here at Morning Lavender to provide women with closet staples they can style multiple ways. We love showing you different ways to wear basic tops that reflect not only the look and personality of a Morning Lavender girl, but also provide you with ensembles for every occasion! This way you’ll never find yourself wearing something once and tossing it to the back of your closet, especially with these cute and feminine white tops! These white and cream pieces will be essentials in your wardrobes because of how versatile and easy to style they are! Phoebe Cream Off the Shoulder Crop Top – This off the shoulder beauty is feminine and flirty, and has the cutest ruffle and button up details! We love how this top can easily be worn with jeans or a printed midi skirt depending on your mood or occasion! Ashlyn Cream Longsleeve Lace Top – One of our best selling tops, this delicate cream lace top transforms any outfit into a sweet and feminine one! Charlotte White Lace Ruffle Halter Top – Feminine, yet edgy. We love the unique layers of lace on this pretty halter top! If you love what you see above, check us on on Instagram to see many more outfit ideas! Want – Earrings that are wider at bottom and thinner at the top, and those with soft curves or a teardrop shape. Why – These earrings will enhance your features with elongated lines and curves that balances out the face and draw attention to the eyes, cheekbones, and jaw line. Want – Any type of drop earrings or dangle earrings and long angular styles. Why – These earrings give your face dimension by elongating it and drawing eyes lower rather than to the middle of your cheeks. Want – Pearls, teardrops, and oval shaped earrings. Why – Just about any style flatters an oval shape, but going for teardrops and studs will draw attention to the elongated face shape without adding too much length or width. Want – Hoop earrings and earrings that are longer. Why – These earrings will soften your cheekbones and jaw line. Why – Studs are instant eye catchers and can add touch of personality to your outfit! We hope you enjoyed these tips on how we style earrings and found new ways to flatter your face shape! For more tips on finding the best feminine accessories for your face shape, check out our post on styling sunglasses here! Our favorite warm weather layering essential is a lightweight printed kimono. Our wide selection of cute floral and tropical print ones provide a kimono for every occasion! Kimonos are so easy to style because you can easily dress them up or down, and they’re a fantastic way to add a bold print to any ensemble. We also love how lightweight they are and how easy it is to store one in your purse or carry-all tote for a quick cover-up when you need it most. Check out how we styled our favorite pieces below for outfit ideas! If you love how we styled these cute printed kimonos above, don’t forget to check out our post that features kimonos as poolside cover-ups! Sunny days lounging by the pool are probably one of our favorite things about Summer! Because wearing your cute summer bikinis all on their own can be cause for some major sunburn and unwanted tan lines, we have a wide selection of cute poolside swim cover ups for every time you hit the pool or beach! Kimonos are probably our favorite layering piece because of how lightweight and versatile they are! You can never really have too many cute printed kimonos in your closet, especially when they’re as gorgeous as the floral and tropical styles we have in store. Kimonos are also great for the pool or beach because you can toss them in your cutest carry-all tote bag and they take up little to no space at all (which means more room for sunblock, mirrored sunnies, and all your other warm weather essentials)! Our Lindy Taupe Maxi Skirt and other gorgeous flowy maxi skirts are perfect to wear over your bikinis when you’re going to an from the beach or pool! This creates a whole separate ensemble and will convert your longline bikini top into a crop top! Our Megan Tropical Print Strapless Romper is one of the cutest of our wide selection of feminine Summer rompers. The tropical and bright print just screams Summer from head to toe, and it even has a ruffled cut for that ultimate flirty touch! Printed rompers are great for wearing over solid colored bikinis to add some color and texture to any monotone look! Our selection of cute and casual Summer dresses can always double as a poolside cover up! Whether you’re a prints, texture, or solids girl we’ve got the flowy and fun styles fit for every personality! Button ups like our Makenna Printed High Low Blouse are a great alternative for a versatile piece you won’t just wear once and store away until next year. This high-low style is especially cute for a poolside cover up because of how unique the cut is! Pretty floral scarves like our Mara Blue and Yellow Floral Scarf make a great sarong because of how lightweight they are! We’ve got the perfect floral printed scarves for every day you’re out in the sun, and you’ll be sure to wear them for more than one occasion! Check out all the different ways we style our favorite scarves here. No brainer pieces like our Connie White Crochet Cover Up and our Tessa Black Crochet Cover Up are the pieces that will make you feel like you’re miles away on a tropical island even when you’re just at your local pool or beach. These pieces were made for lounging on a hammock with a fruity cocktail by your side! If you love what you see above, don’t forget to check out our Summer Lookbook for all of your vacation and daycation needs! With Summer here and the days warm and sunny, we can’t help but want to wear our lightweight Summer dresses every single day! Unfortunately that isn’t always possible, especially when we have to be in the office during the week. Not only that, but offices that may or may not have A/C that make you dread your long button ups and pantsuits. That being said, we came up with these tips to follow for hot trends for staying cool in the office. We even snuck in our favorite lemon print skirt and feminine floral sundress so you don’t have to save them for the weekend! Cute printed skirts like our Piper Stripe Lemon Print Skirt embody Summer wherever you go! 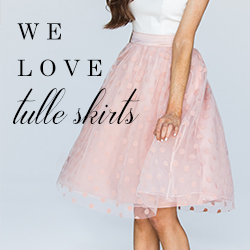 This skirt like our many pretty midi skirts are great for wearing in the office because of the longer length! Pair it with one of our cute off the shoulder tops for a lightweight and office appropriate look that can double as your weekend brunch outfit too (we won’t tell)! These black wide leg trousers are a breezy and chic option for wearing pants in the office! Who said covering up meant opting for stiff and uncomfortable pantsuits?! Pairing these pants with a cute layered crop top will have you feeling like you can take on the world from inside the walls of your cubicle! The best way to wear your favorite cute Summer dresses is to layer them under an office appropriate lightweight jacket! The one photographed above isn’t just the perfect shade of lavender to match all of your staple floral sundresses, but it’s a versatile color you’ll be able to wear all year long for effortless layering! Our super comfortable white ripped jeans couldn’t look better with our classic striped button up! This pairing will make every day feel like casual Friday, even when it isn’t! Did we mention how versatile our Riley Striped Button Up is too? See how we styled it 11 different ways! If you loved reading about these hottest trends for staying cool in the office, don’t forget to check out more lightweight and chic work outfits here!